Work groups and other organizations are always welcome to volunteer at one of our upcoming Volunteer Service Days. Always reach out to Shawn Green, our Volunteer Manager, to make arrangements. This helps us to plan workday supplies and keeps you in touch in the event that weather cancels the workday. 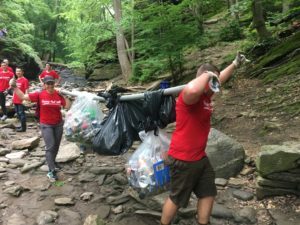 If you are interested in bringing a group out for a private workday, please consider becoming a corporate sponsor of Friends of the Wissahickon. This not only supports the conservation of Wissahickon Valley Park, but allows us to be more flexible with day, time, and project for your company. Contact Shawn Green, Volunteer Manager at green@fow.org for more information and to make arrangements.